WASHINGTON, DC, March 10, 2011 (ENS) – The nuclear industry association and 16 of its member companies have filed suit in federal court seeking suspension of the fee that consumers of electricity produced at nuclear energy facilities pay for the federal government’s spent nuclear fuel management activities. The Nuclear Energy Institute filed the lawsuit Tuesday in the U.S. Court of Appeals for the District of Columbia Circuit. The National Association of Regulatory Utility Commissioners also filed suit against the U.S. Department of Energy on Monday, seeking similar relief. Nuclear Energy Institute is joined in the litigation by Florida Power & Light Co.; NextEra Energy Seabrook, LLC; NextEra Energy Duane Arnold, LLC; NextEra Energy Point Beach, LLC; Omaha Public Power District; PSEG Nuclear, LLC; Indiana Michigan Power Co.; Energy Northwest; PPL Susquehanna, LLC; Detroit Edison Co.; Nebraska Public Power District; Northern States Power Co.; Kansas City Power & Light Co.; Kansas Electric Power Cooperative, Inc.; Kansas Gas & Electric Co.; and Wolf Creek Nuclear Operating Corp. The lawsuit asks the court to direct the U.S. Department of Energy to suspend collection of the one-tenth of a cent per kilowatt-hour surcharge that consumers pay on their electric bills pending DOE’s compliance with provisions of the Nuclear Waste Policy Act of 1982. Congress created the fee in 1982 to help pay for a permanent geologic nuclear waste repository beneath Yucca Mountain 100 miles northwest of Las Vegas. The U.S. Department of Energy had planned to use the mountain to bury 77,000 tons of highly radioactive waste. The Yucca Mountain site was approved by Congress and President George W. Bush in 2002. The Nuclear Regulatory Commission began licensing hearings for Yucca Mountain in 2009 but they were put on hold when the Obama administration said it would terminate the program. The fee is paid to the Nuclear Waste Fund, held in the U.S. Treasury. The industry contends that a review of the need to continue the fee performed by the Energy Department is inadequate and that the fee for the used fuel management program should be suspended. The fee amounts to approximately $750 million in annual revenues for the Nuclear Waste Fund, which has a balance of more than $24 billion. NEI and the plaintiff companies argue that collection of the fee is not necessary given that the Obama administration’s budget request for fiscal 2012 does not include any funding for the used nuclear fuel management program. Nuclear Regulatory Commission Chairman Gregory Jaczko has said plans call for the Yucca Mountain licensing board to go out of business sometime this year. The agency has requested no funding for the Yucca issue beyond September 30 in keeping with Obama administration policy. But on February 26 a panel of judges with the Atomic Safety and Licensing Board, a part of the NRC, issued two orders that keep active the licensing case for the Yucca Mountain nuclear waste plan. Nuclear power in the United States is provided by 104 commercial nuclear power plants, providing approximately 20 percent of the nation’s electricity. 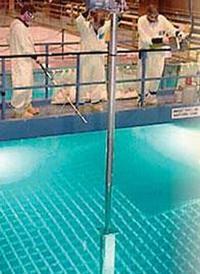 In the absence of a permanent geologic repository for spent nuclear fuel, it is being stored at the power plants where it was used, either in pools of water or in dry casks.